Some homeowners regard glass windows set into the roofline as a luxury—the construction equivalent of a whirlpool hot tub in a bathroom or an outdoor kitchen on the patio. But skylights or roof windows are much more than a luxury, especially in regions that receive limited natural light, or with house construction where there is a limitation in wall area available for windows. In a second-story living space tucked beneath sloped rooflines, the presence of skylights may spell the difference between a bright, friendly space and a murky cave. In a home built between closely adjoining neighboring houses, skylights may be the best solution for introducing good natural light into rooms. In a one-story house build built with an "open-concept" floor plan, skylight shafts can bring much needed natural light into the center of large spaces. Terminology: Skylight, Roof Window, Light Shaft, Tube Window? Homeowners considering some form of glass set into the roof line can sometimes be confused by the various terms they encounter. It doesn't help that window manufacturers do not use the terms with any kind of consistency. For some, the terms skylight and roof window are entirely synonymous, while for other manufacturers, the differences are notable and important. A skylight is a fixed window set into the roof line. It may incorporate venting options, but the window itself does not open. In Europe, this type of window may be called a rooflite. A roof window is a window that actually opens, usually with a pivoting "awning" style mechanism. It may even incorporate window screening, in much the same way as an awning-style window set in side walls. Some manufacturers, however, call this type of window a "venting skylight." A light shaft refers to a structural adaptation in which a walled shaft passes through between roof trusses or joists to link a room ceiling to a skylight or roof window. This shaft is sometimes called a chase. This is often the construction used in one-story homes, where a horizontal opening in the ceiling leads is connected to the roof-mounted window by a framed and finished shaft. The framing required by a shaft can add considerably to the cost of a skylight. A tube window is a simplified and inexpensive form of light shaft, in which a small bubble dome window set into the roof line is linked to a lower ceiling by means of a flexible reflective tube. A tube skylight is normally used for small spaces, to provide outdoor light to a small bathroom, closet, or laundry room. This is a very inexpensive option. There are nearly as many options for windows set into the roofline as there are for windows in walls. While operating mechanisms are somewhat more limited (you rarely find sliding windows or double-hung style used in roofs, for example), you have the same options for glazing and glass. Some types of roof windows are operated by remote control motors—which is essential if you want a vented window set high above in a light shaft. Glass for roof windows and skylights is typically made from highly shatter-resistant glass, since these windows may be subject to impact from hail or falling tree branches. Beyond this, you'll have options for single, double-, or triple-pane glass, reflective coatings, gas-filled chambers between glass panels, and all the other options common with traditional wall windows. Just as with traditional windows for walls, you have options for how to install roof windows or skylights. They can be installed yourself, by the window company, or by a traditional carpenter or general contractor. Homeowner installation: If your skylight is small enough to fit between two trusses or rafters, your installation job will be vastly easier than if you need to cut away trusses or rafters. Many roof manufacturers include detailed instructions that make this a job that a skilled DIYer can easily tackle. If you feel comfortable with basic carpentry, shingling, basic window installation, drywall work, and painting—the same skills that go into installing a traditional window in a side wall—you can put in your own skylight or roof window. For motor-driven skylights, you’ll need electrical experience, too. DIY skylight installation is not a project that lends itself to impulsiveness. Be sure to consider your strengths and weaknesses before tackling a job that punches a hole in your roof line. Window company: Any search for replacement windows will soon lead you to qualified professionals who can install skylights and roof windows. 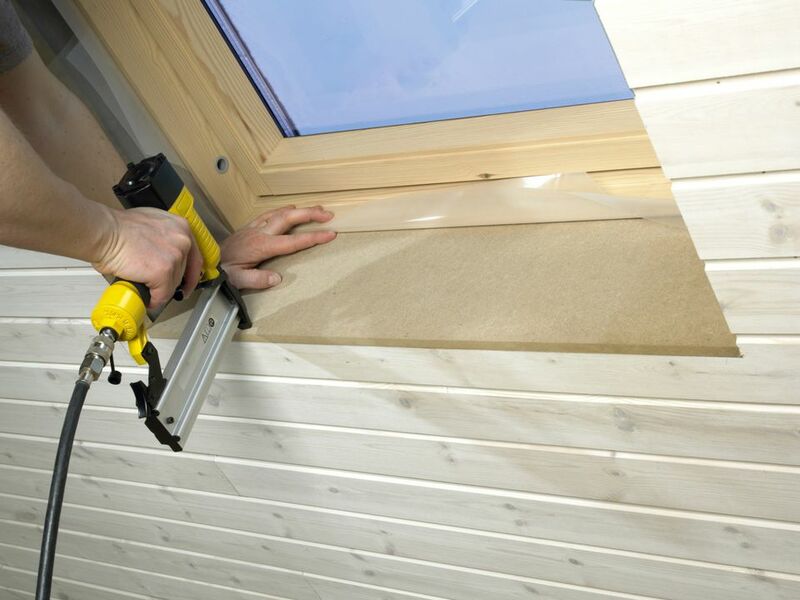 Pella, Marvin, and Andersen are among the big names in windows who can not only supply you with a skylight but also the qualified professionals to install it. The big downside here is that most window-only companies will do just that: install the window only. They will require a fully framed-out area in advance so that all they need to do is put in the skylight. Everything else—including the skylight shaft, where necessary—is up to you. For this reason, this is an expensive option. But it is also an option that pretty much guarantees a quality, warranty-backed installation. Carpenter or contractor: Any general contractor, general carpenter, and even some good handymen should be able to install your skylight. This option will be vastly cheaper than going with the window contractor. With this option, the GC wears two hats: framing the area and also installing the skylight itself. A GC will outsource activities to sub-contractors (notably, drywall work for the shaft). A carpenter/ handyman/ fix it guy, on the other hand, may do everything with just himself and a partner. The best advice here is to make sure to work with a GC or carpenter based on a recommendation from someone who has used them successfully. Traditional windows are always cheaper than installing skylights. Where windows in sidewalls can be installed and will offer the necessary light, they are usually a better option. Windows are often required by building code because they provide egress (escape) in the event of emergencies. A skylight or roof window cannot always be used as a replacement for windows. Some manufacturers, however, offer roof windows with the spacing required to qualify as egress openings. There will, however, need to be a means for climbing down off the roof in order for the roof windows to meet the legal requirements for an egress window. The "solar gain" on a skylight or roof window is notable. This can be an advantage in cold climates, where the winter sun beaming down on the roof window can help heat a space. But it can be a distinct disadvantage in the summer or in warmer climates. Many skylights don't come with any kind of blind or method for blocking out the sun. This is an option that will usually cost you more. Manually venting Velux roof window, 21 inches x 37 3/4 inches: $506. These prices are not appreciably more than for good-quality wall windows designed for new construction. Cutting a hole in the roof and alter the rafter framing usually costs about $200. This cost can be considerably more for very wide windows that require cutting out trusses and reframing them. Choosing windows narrow enough to fit between roof trusses is a good idea that will keep your costs manageable. Installing and flashing the window itself will cost $200 to $300 for asphalt shingles, 20 to 30 percent more for metal or tile roofing. Building a chase (shaft) from the skylight to the interior ceiling will cost $1,000 to $1,500. Repainting the ceiling beneath the skylight will cost at least $250 if you hire a pro. Be aware that labor costs can vary considerably from region to region.